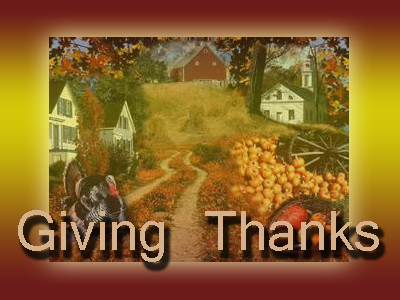 10- This Thanksgiving Day let all truth seekers be thankful for the fact that America still exists. We've had many of our rights stripped away. The last several presidents have done everything in their power to destroy the constitution and they've succeeded in many ways, nonetheless the structure and the concept of America is still in place and that means there is still a chance to turn this thing around. 9- This Thanksgiving let's be thankful that the opportunity to choose who you want to be is still there. The freedom to choose your career is still there within your reach for the most part. Every work field, job, career and opportunity comes with varying degrees of commitment, dedication and sacrifice but all in all the concept of choice is still viable and realistic at least for most of us if not all and for that we should be thankful for. 8- Let's be thankful that despite geoengineering programs that include the daily spraying of our skies with nano-sized varieties of metal particles, we are all still alive and in position to plan a long term strategy against the globalist, the U.S. Air Force and private contractors involved in these spraying programs. Let's be thankful that we still have time to plan out a long term plan of awareness, detoxification and a variety of historic actions against this agenda. Thankfully we have several generations still alive that are firsthand eye witnesses to the fact that there was a time (in our childhood) when humanity was not being sprayed. We bear full (firsthand) witness that there was a time when we had uninterrupted blue skies every single day without any lines in the sky despite the fact that planes existed and were emitting exhaust from jet fuel without making any supposed contrails. The beauty of having millions of people on earth that bear witness to these now historic crimes and times and bare this historic testimony for future generations to understand is reason to be amazed and thankful for. 7- Let's be thankful that the corrupt government in place in America, despite it's effective and vital mainstream media mouthpiece, is slowly failing as people begin to realize how corrupt it is. Too many stories of government corruption both domestically and abroad serve only to remind us that governments primary reason for existence is control. Governments are inherently about control, oppression and intimidation, a formula which has never worked throughout history for gaining the trust and confidence of the people. This failure of government is thus a prerequisite piece of knowledge and awareness which will and is already propelling humanity in America and the world to wake up to the over all plans of the controllers. 6- Let's be thankful for the breakthroughs we've had in medicine in particular natural medicine including the exposure of the truth behind cancer which is one of the leading causes of death in America and has morphed into an epidemic. Let's be thankful for the knowledge that has come out to allow people to take control of their lives and live healthy. I'm thankful for the courage CDC scientist/whistleblower had to expose the dangers behind vaccines. Think of how far back in progress we would be if it were not for these advances in medical knowledge, understanding and awareness that has been shared by many in the last few decades. And think of the lives that have been saved as a result of all the new knowledge. 5- Let's give thanks for that fact that natural non-GMO organic foods still exist and can still be purchased and grown even in your own home. Yes, you can still legally grow your own garden of food and be a lot less dependent on the system. The time has not yet come when food is scarce and all is controlled by government. Sometimes we can lose site of good things that are happening because we get so consumed with the bad. Food justice and democracy is actually one of the areas where truth seekers have accomplished the most in the last decade or more. Thankfully several very effective and dedicated organizations have committed themselves to fighting for our food rights and they have accomplished a lot and for that I am extremely grateful. 4- This Thanksgiving lets be thankful for the spread of information via the internet and alternative media. Imagine a world with only mainstream media news to choose from? Imagine no internet, no alternative views on any topic other than the mainstream media's version? Thankfully this is not the case. In fact statistics show that mainstream media is slowly dying. We've heard Hillary Clinton complain the western propaganda machine media is losing the war of information to the alternative media and that is reason to be thankful. In a battle often marked by major loses of freedom and large advances in tyranny these small victories must be cherished. 3- I am thankful this Thanksgiving for the fact that there has not seen any nuclear wars or nuclear weapons deployed against America with mass casualties, whether false flag or not. That's right, no false flag nuclear attack has happened (yet) for whatever reason and we should be thankful for this. CIA's/Mossad's ISIS and Al Qaeda have not been hired for any operation of this size as of this day. Despite the stockpile of nuclear weapon we have, there has not been any actual physical deployment of these weapons. For this I am thankful and I hope that we can reduce and ultimately discard of nuclear weapons in the future long after humanity heads in a new direction of peace and prosperity. 2- Let's be thankful for court rulings, the judge decisions and the police actions that are fair and just. These are the stories we never hear about in the mainstream media, where the good guys actually win. The ones when they get it right. There are actually many stories that end well and fair every single day but these stories do nothing to advance the control systems agenda. The mainstream media subsequently has no interest in these stories. These are not the stories they want you to be exposed to every day as they represent the antithesis of the master plan. Imagine if every single day the mainstream media bombarded you with good stories? Stories with no scaremongering or political propaganda agenda? Just good human stories to uplift your soul and make you feel good about yourself, can you truly imagine this? This idea is so far fetched that most of us can't even imagine this scenario. Today I am thankful because I know that these stories are real and they are still happening despite the non-coverage by mainstream media. 1- Finally, this Thanksgiving as a truth seeker who is interested in the truth about our government and our world, I am thankful for this moment in history. A moment where all of us who are awakened are experiencing in real-time the slow but dramatic transformation of humanity from a species completely asleep and unaware of the globalist plans to one (as Zbigniew Brzezinski put it) more politically awakened than at any point in history. That's right, humanity is waking up and everyone reading this is probably one of the reasons. We choose to do what we do because we are all chosen. Our consciousness was chosen, we are part of the manifestation of humanity that is playing a critical role in the mass awakening of humanity. This is the inevitable mass awakening that the globalist know they can't stop. This is the inevitable mass awakening that has forced them to act desperately with one false flag after another. The same mass awakening that forced Obama to tell graduates of Ohio State a year ago specifically to NOT listen to the voices warning of tyranny. The same mass awakening that forced the globalist to pull the MH17 story out of the spotlight for fear of too many people getting it. And the same mass awakening that forced Google to block the viewing of the fake James Foley beheading video for fear that the masses would easily and quickly see for themselves that the beheading video was a fraud. We should be thankful for this mass awakening which at this point is irreversible. That's right, I've said it many times, I myself could cross over to the dark side tomorrow and join CNN, ISIS or CIA and despite anything you or I do mass awakening or true paradigm shift is bound to happen with or without us. When it will happen and how long it will take is anyone's guess but it will happen. Humanity is constantly changing and given the information age and the repeated old CIA mainstream media propaganda tactics, people are finally figuring out the same old patterns over and over. Problem reaction solution, appealing to emotions, mass media scripted timings and breaking news. The script is getting old. Humanity is finding ways to resist the poisons we are surrounded by. People are figuring out that 30+ vaccines in the first few years of life might not be the way to go. They are figuring out that eating healthy is the way to go, and to become increasingly independent from government is the meaning of true freedom. There is a light burning in the lighthouse of freedom. There is a flame burning in many of our hearts and this flame is eternal. There is hope and there is a renewal and reshaping of the paradigm of who we are. The change is going in one direction and that is TOWARD awakening not the other way around. Mainstream media is factually losing their audience and Americans more than ever are clearly recognizing every false flag and staged news they present. Soon it will be checkmate for the globalist and their mainstream media and for that I am eternally thankful on this Thanksgiving day.